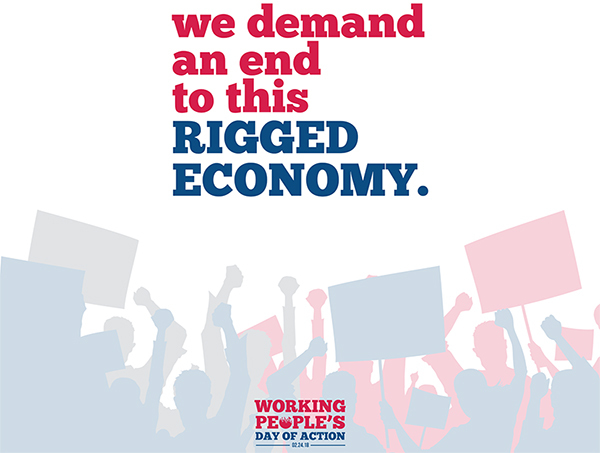 On February 24, in cities across the country, CWA members and allies will unite with thousands of working people to demand an end to an economy that's rigged in favor of the wealthiest and most powerful. Why are we taking to the streets now? Because in late February, the Supreme Court will hear a court case called Janus v. AFSCME Council 31. This case is the culmination of decades of attacks on working people by corporate CEOs, the wealthiest 1%, and the politicians that do their bidding to rig the economy in their favor. It's meant to destroy the ability of people who work in the public sector, including more than 100,000 CWA members, to join together in unions to negotiate better wages, benefits, and protections that improve work conditions and set standards for everyone. The potential effects of a negative decision will be felt at every level of CWA and the labor movement as a whole. It's up to us to fight back – through the CWA STRONG program, which strengthens our union at all levels, and by taking to the streets. On the Working People's Day of Action, we will stand up for the freedom of working people to join together in strong unions and fight for decent and equitable pay for our work, affordable health care, quality schools, vibrant communities, and a secure future for all of us. Join your local Working People's Day of Action here. More than 12,000 CWA-represented AT&T wireless workers from nine southeastern states and the U.S. Virgin Islands won increased wages, more job security, and rollbacks of offshoring and outsourcing in a tentative contract agreement announced on February 15. 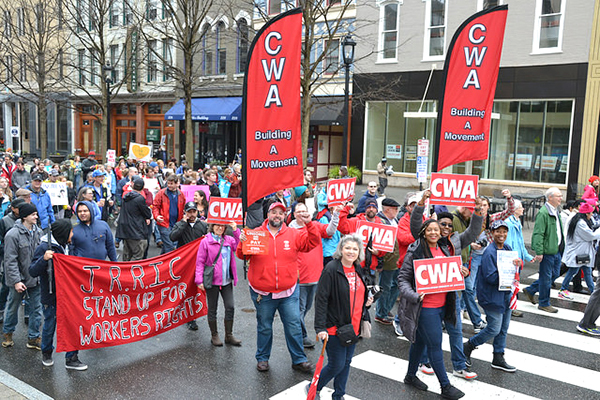 "I am proud of our bargaining committee and the CWA members from across the country who supported their efforts with rallies and picketing events," said Richard Honeycutt, Vice President of CWA's District 3. "We are continuing to set new standards in the wireless industry and we are demonstrating that the best way for working people to achieve better pay and fair treatment on the job is by joining together in a union." The four-year proposed agreement provides 10.1% in raises over the course of the contract and shifts $2,500 from commission to base pay for retail workers. The agreement sets guarantees for the portion of customer service calls that will be handled exclusively by wireless workers who are CWA members in the areas covered by the agreement. Editorial employees at the digital news site Mic are requesting voluntary recognition of their union from management. Citing Mic's core mission of "giving voice to the unrepresented," employees are hopeful management will do the right thing and recognize their union. "I am so proud that the overwhelming majority of Mic reporters, editors, correspondents, social media editors, producers, and copy editors have come together as a collective voice to improve Mic's workplace," said Kelsey Sutton, Mic political reporter. New Mexico's Third Judicial District Assistant Attorneys voted to join CWA this week. "All employees deserve a voice in their workplace, including professional employees," the attorneys said after the vote. "We are seeking a fair contract where we are respected and treated like the professionals we are." "We organized because with fewer and fewer positions being backfilled, we needed a way to collectively address the inequitable workloads we have been assigned, and still serve the citizens of New Mexico in the best way possible with waning resources. The best way to do this is through collective bargaining." A new survey of 900 CWA-represented passenger service agents at Envoy, an American Airlines wholly-owned carrier, shows that 27 percent of respondents must rely on public assistance to make ends meet and many are forced to go to extreme measures to cover basic living expenses, including selling plasma, buying out-of-date food, and borrowing against retirement accounts. Despite American Airlines reporting $1.9 billion in profits in 2017, agents at Envoy Air are paid as little as $9.48 an hour. The survey highlights the growing concerns expressed by Envoy agents who are bargaining for their first union contract. "While profits churn at American Airlines and executives enjoy massive tax cuts, the hardworking passenger service agents at Envoy Air are forced to rely on taxpayer-funded assistance programs and take extreme measures like selling their own plasma to scrape by," said Chris Shelton, President of the Communications Workers of America (CWA). "Envoy agents, their union family, and elected officials are standing up to say we've had enough of American Airlines shortchanging working people. American Airlines CEO Doug Parker can end this financial crisis for thousands of families right now and pay all passenger service agents family-supporting wages." Earlier this month, more than 80 members of Congress sent a letter to American Airlines CEO Doug Parker urging him to "conclude your collective bargaining negotiations and ensure that all of your employees can earn a living wage." Although the passengers bought their tickets through American Airlines, Gower works for the company's subsidiary, Envoy Air, which operates regional flights for the Fort Worth-based carrier under the American Eagle brand. Gower and her coworkers are fighting for what they describe as a livable wage as their union negotiates with Envoy for what would be their first ever collectively bargained contract. "I think most Americans would be shocked at the low wages," said Richard Honeycutt, a vice president with the CWA. 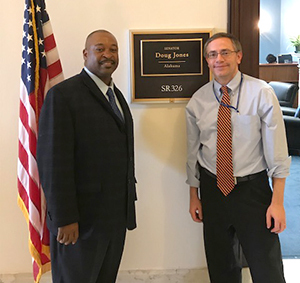 IUE-CWA Local 83693 President Antonio Williams (left) met with Senator Doug Jones' (D-AL) Legislative Director Mark Libell in Washington, DC. "My union and our members are extremely concerned about the harm that imports of silicon metal from Australia, Brazil, Kazakhstan, and Norway have inflicted on Globe and its workers," said Williams. "I have worked at the plant for 13 years as a furnace operator. My job has enabled me to support my family ‒ my wife and our two daughters." "The Selma plant is an important employer for the surrounding area as a source of long-term good union manufacturing jobs. I can tell you based on my own experience how important my employment at the Selma plant is to me and my family. The Selma plant was shut down from February 2016 through June 2017 and I was laid off. During that period, I had to find two jobs. I had to work 60 hours per week to make less than what I made at the Selma plant where I worked 40 hours." "We are very proud of the work we do and we work hard to be efficient and safe. But we cannot compete with imports that are dumped and unfairly subsidized. We suffered when the Selma plant was shut down for over a year. Please help us keep our jobs and the plant open. We need the support of our government to make sure we are able to compete on a level playing field." CWA members from Local 6215 staged a mock funeral "Solidarity & Grief" ceremony last week to mourn layoffs of at least 178 AT&T call center employees, effective March 2018. On the heels of multi-million dollar tax cuts for corporations, union members are calling out AT&T for killing off jobs and creating hardship and uncertainty for hard-working families.